Congratulations on your admittance to Peabody College’s Higher Education Administration master’s program. 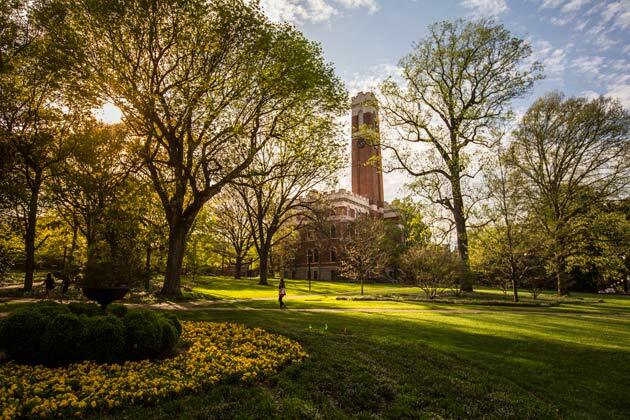 Peabody College and the Department of Leadership, Policy and Organizations are proud partners with the Office of the Dean of Students, which manages graduate assistantship positions in the Office of the Dean of Students and in a number of other offices at Vanderbilt. 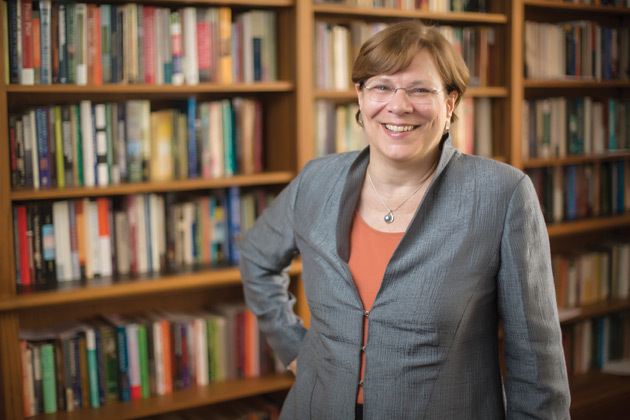 These assistantships provide compensation and give students the opportunity to connect theory learned in the classroom with practical work experience. 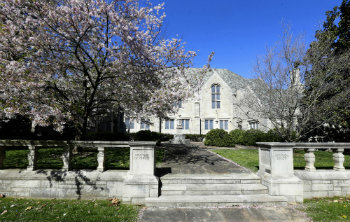 If you are interested in applying for an assistantship, please visit the hiring site at Vanderbilt.erezlife.com. Here, you can create a profile, view, and apply for available positions. The priority deadline for applying is Thursday, February 28th, but applications will be considered after this date and until all available positions are filled. On-campus interviews will be conducted from 9:00 am – 4:00 pm on Thursday, March 21st, the day before Master’s Welcome Weekend. Interviews will be held at Sarratt Student Center and in surrounding offices. If you are unable to interview in person, please state that in your cover letter so that you may be considered for a phone or Skype interview. Please visit this website for all GA Interview Day logistics. For questions about GA Interview Day, please see the Frequently Asked Questions section below. How many positions should I apply to? We encourage applicants to cast a wide net. Some positions will receive between 50 – 60 applications for one available GA position and thus can be more competitive. Some HEA admits will apply to every available position though, we encourage you to only apply for the positions you would seriously consider. Are references required as part of the GA application process? For the initial application in eRezLife, no. After GA Interview Day, if an office is interested in moving forward with you as a candidate they will reach out to ask for the contact information for your references. I was admitted to another program besides Higher Education Administration. Am I still eligible to apply? Yes. While offices will show preference to HEA applications, the positions are available for all Peabody admits. Currently, we have a GAs from HEA, HDC, MPP, IEPM, and CDA. Where can I find information about GA opportunities for my Peabody program? Different departments share their opportunities at different times. We recommend contacting someone from your department and checking the Peabody Job Board, linked through the Additional Opportunities section below. I received a scholarship from Peabody. Can I stack my scholarship with a GA position? Typically, the GA position is more advantageous and of greater value than the Peabody scholarships. Since the Graduate Student Workers (GSW) and Graduate Area Coordinator (GAC) positions are not tuition based in compensation, you are able to combine your package with your Peabody scholarship. For any further questions about your scholarship, please email DOSAssistantships@Vanderbilt.edu. What if I can’t attend GA Interview Day? You are still eligible to apply for positions. If you cannot attend, please indicate this in your Cover Letter. Once offices extend their offers, you can follow up with them to schedule either a phone or video interview. How many interviews should I expect to have on GA Interview Day? Of course, this depends on how many positions you applied for. If you cast a wide net with your applications, you can expect 3 – 4 interviews. How long are interviews expected to last? Interviews are scheduled every half hour from 9 AM – 4 PM. Each interview will last approximately 25 minutes. We recommend not scheduling your interviews back to back so that you have time to commute between offices. What is the GA Reception? The GA Reception is an opportunity for admitted students to meet with supervisors from across Dean of Students. Light refreshments and snacks will be served and all applicants are encouraged to attend. I’m really interested in a specific position and wasn’t offered an interview? How can I express my interest? Plan to attend the GA Reception. Offices might be willing to set up an additional interview time with you over the weekend or via phone or Skype. 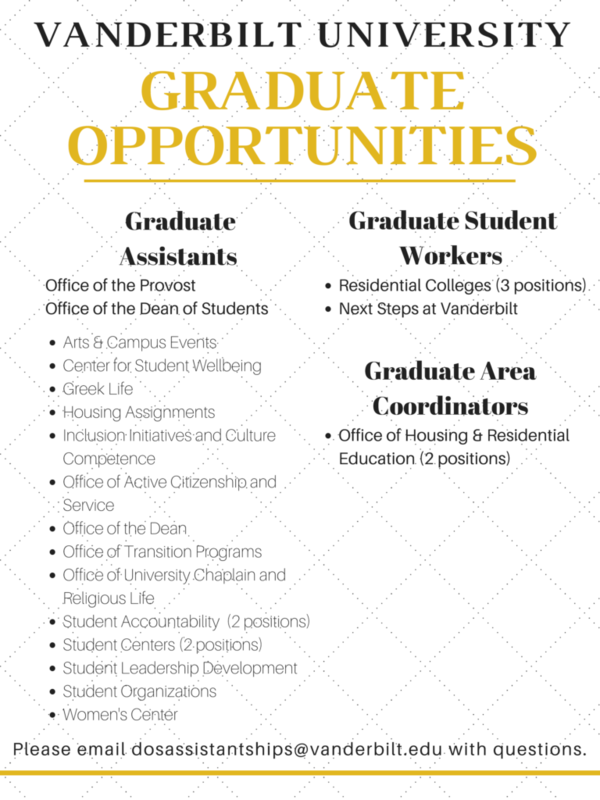 ADDITIONAL QUESTIONS regarding Dean of Students graduate assistantships and related assistantship opportunities should be directed to DOSAssistantships@Vanderbilt.edu. A member of the Dean of Students team will be in touch to assist you. Occasionally, offices will have additional work opportunities for graduate students. 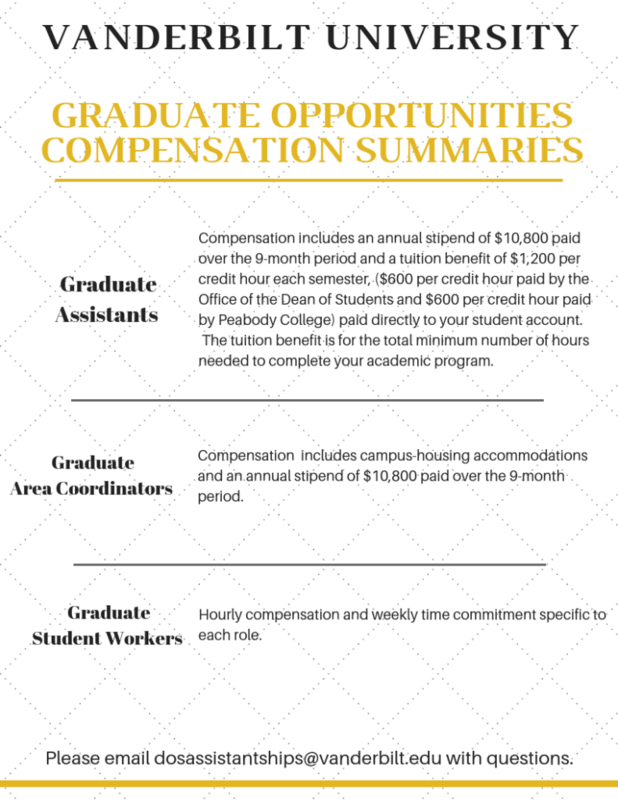 These positions are not part of the graduate assistantship program and the responsibilities, time requirements, and levels of compensation vary. To apply, send materials to the appropriate contact listed in the job description.